The joy of enjoying a weekend off. Labor day is just that. I day to remember everything that has happened in our history to make it where we, as people, fought for safety, care, child labor, and the such in the American system. To us now, the workers it was a time of rest. Or it should have been. I dislike all those that had to work retail hours for “sales” or food service to keep those shoppers belly’s full, but I won’t rant about that. Nope, I’m here to pat myself on the back. It may not seem like much, but I got over 3600 words in today in a matter of an hour. Written and typed. The picture below will show my lovely marked left hand through my odd process. It is tough when one has inspiration and obligation at the same time and of course conflict ensues. Locking oneself up in the bedroom with a notebook seems to help if I throw a big enough temper tantrum. So with what I have written, I have finished section 2 of book 2 and working on the third before they all intertwine together. My beta readers have been very helpful in the matter and I still heart them all. The promotion for the first book went quite well, I am sweating bullets thinking of all those who may or may not like it…..but I march on. So there it is. I didn’t work the weekend but back to the hand cramps once again. That looks a little painful. Congrats on the progress. left handed smear and the awful curvature of the hand since the world attempted to make me right handed. At least in school. Notice the chicken scratch on the paper below? Yeah, that’s what i have to decipher to type it out. 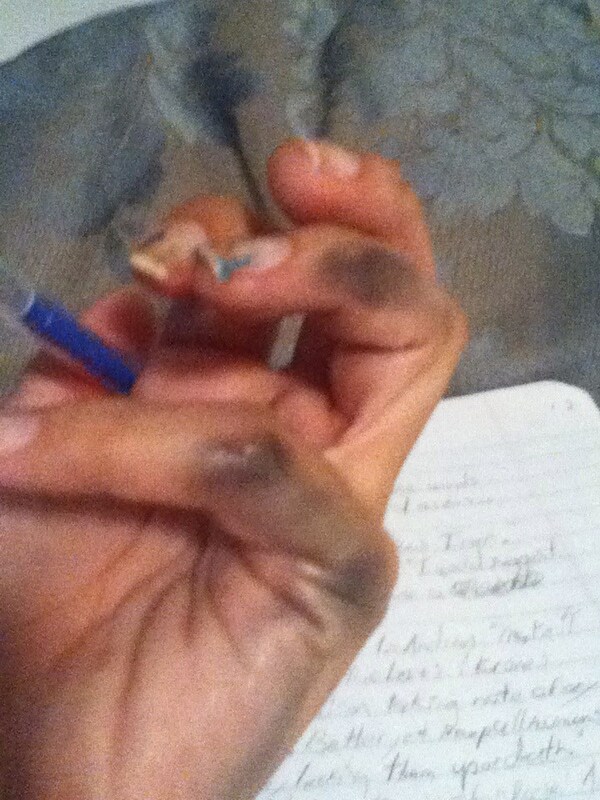 Ever see a left handed person write? My mom is left-handed actually. Never understood the forcing of right-handedness. I thought we were out of the ‘left handed dominance is a sign of Satan’ era. I outline by hand and write the big stuff on the PC. Mostly because I hate having ink or lead on my hands. my stuff is an erradic mess. Papers here, research there, my head isn’t organized and I’m not sure if i outline. I just know what is going to be done and do it. My brain keeps most everything but the research and notes I have scribbled about. I edit by hand though, so I’m not as smart as one would think. ahhhhh the dreaded red pen off death!! I use pencil. Red pen makes me think I’m grading math tests. easiest pens that come in bulk for me since I have a few people and things that like to make people disappear. Maybe its the goblin coming from my goblin door. I hate those goblins. Still have no idea where they’re hiding here. It certainly would. I don’t remember if you mentioned it before. Goblins are entirely different than regular horror. They’re craftier and more magical. I’m Jewish, so I guess my goblins take stuff because they think it’s all on sale. I remember reading that goblins are a type of dark fae. Depends on the region. I bet they love the free socks in the dryer day don’t they?